In April of 2018 we moved into a 12,500 square foot space at the Brooklyn Navy Yard, New York’s largest and oldest industrial facility, about 1.5 miles from our flagship store. Even though we were very excited to move into this dynamic and august location, we were nervous to be so far away from our beloved tiny shop! 1.5 miles may sound close, but in New York, it can feel like light years. We had always made it a priority to keep our offices and jewelry studio within blocks of the store (in fact, for many years we worked out of the tiny basement of our tiny shop, and then we took over the tiny apartment above the shop, and on and on). Catbird is made up of more than the sum of its parts, and having a team that was steeped in the same experience is part of what we think makes us so special. But we ended up with a very happy problem: We needed more space than our neighborhood could provide! Many members of our customer service team have been at Catbird since the days when our office was a 250 square foot studio apartment above the store, And with a combined 25+ years of Catbird experience, they really know their stuff. Once we had exhausted all of our options in Williamsburg, we turned to the Brooklyn Navy Yard. We can spread our Catbird wings here, but we still hold very tight to the idea that keeping our team close is how we keep Catbird special. Many members of our customer service team have been at Catbird since the days when our office was a 250 square foot studio apartment above the store, and with a combined 25+ years of Catbird experience, they really know their stuff. When we say “We are here to help!”, we mean it literally. As a company we have gotten bigger, but our customer service team continues to (and will always be!) right in the heart of Catbird. Their sunny open, beautiful work space is the center of Catbird HQ, between the jewelry studio and the office where our creative team works, so they truly are in the middle of it all! The Catbird concierge team is a mighty team dedicated to providing the support you want when it comes to buying an engagement ring online. We do not work on commission and our only goal is to help you find the right ring for you. Whether you send your questions via email or through live chat, we're ready and delighted to be your guide to finding the most beautiful ring for you or helping with any issues that may have arisen, whether it’s repairing your ring or resizing it. Working in the same physical space as our studio means that all day long there is a dialogue between departments! We are always running to the studio to ask questions, and to make sure that all the information we share with you is in-depth, accurate and vetted by our in-house jewelers. Discover what happens when you interact with expert Catbirds about anything and everything wedding-related. Reach out by email and a conversation will get started within one business day. The concierge team receives around 1,500 wedding-related inquiries a month, ranging from four paragraph emails explaining a partner’s style and asking for help choosing the right ring to simple questions like how to get a ring resized. The honest truth: we welcome each and every kind of question and love guiding you to the right answer. Whether we end up sending just one email back to you and your query is answered or we have a conversation that lasts for months, we are committed to making sure you’re completely sure about every step of your buying experience. We love nothing more than guiding someone from wedding ring confusion to wedding ring confidence. Reach out through live chat and you’ll be speaking with a Catbird expert within seconds. We recently launched a dedicated live chat function specifically for wedding and engagement ring questions. Simply type on the live chat widget on our homepage between the hours of 10am and 5pm (ET) on weekdays and we’ll be happy to get the conversation started. We love nothing more than guiding someone from wedding ring confusion to wedding ring confidence. 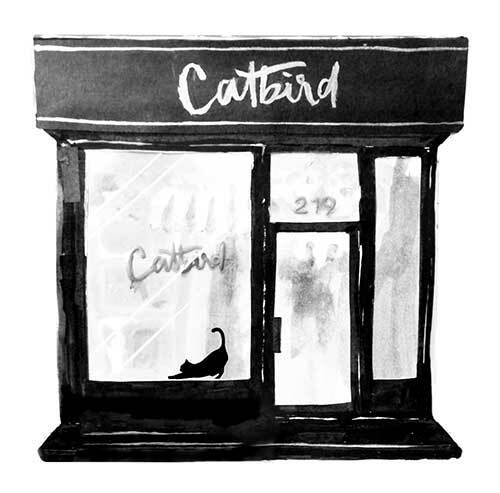 What makes Catbird’s online concierge team so special? Our concierge team member, Saskia, sums it up perfectly: “Our customers are coming to us for advice on something they will have the rest of their lives, so we get emotionally invested.” The team's kindness, patience, and expertise are nonpareil, a close-knit crew who will look after you as if they worked in your local neighborhood shop. Don’t be surprised to find a collection of photos taken by a concierge team member in an email when you ask what a certain ring looks like. There have been many times when Saskia has headed out of our office and over to the Wedding Annex in Williamsburg to take some photos of what different rings look like in person, paired with other rings, and in different lighting. Want to see it up close? Stacked with other rings? Whatever angle you’d like to see, our team is always willing to take as many photos as needed to help you feel like you’re trying on the ring yourself. Great question! Finding the right engagement ring and wedding band pairing is a very personal process that’s often helped by trying on a variety of bands alongside your engagement ring. To help Emily, Saskia came to the rescue with an assortment of photos showing the Beloved Solitaire paired with a bunch of different bands, and added in some styles that Emily hadn’t considered. “It was so fun to share and ask for input from trusted friends and pick the perfect ring to wear for the rest of my life,” says Emily. Emily decided to pair her Beloved Solitaire ring with the Baguette Half Eternity Band, which was a delightful surprise. “I thought I would choose something else, but after seeing pictures of the pairing, I fell in love with how unique and different the rings look together,” she says. "How do I narrow down the ring choices to match my partner’s style perfectly?" We strive to find the right ring for everyone. To do so, we take into consideration lifestyle, personal style, and even who they follow on Instagram. We work closely with you to figure out if your partner will be better with a delicate or sturdier ring (by asking if their work or hobbies involve using their hands a lot) and what design and style might fit their personal fashion choices and lifestyle. We’ve helped with ring decisions based on descriptions of clothing, favorite jewelry pieces, and even just snippets of their personality. Do they love jazz clubs? Is their head always in the clouds or are they more practical? We’ll dig deep to help you narrow down the choices for exactly who they are. While we make sure all of our jewelry is as strong and resilient as possible, sometimes damage and breakage happens. All the wedding rings sold at Catbird come with a lifetime guarantee and we will work as hard as possible to fix any damages or breakage that may occur. However, we stress the importance of choosing a ring that fits your lifestyle best and to only come to us for repairs, for both Catbird and designer rings. We can’t be responsible for any repairs a third party does. If an issue arises due to manufacturing, Catbird will cover any repair or replacement fees. Our warranty excludes coverage due to wear and tear and/or negligence. Within the first year of purchase we will replace side or accent diamonds that go missing if we feel that it is a manufacturing defect. Repairs for all online purchases need to be approved by Catbird staff, so please email us at support@catbirdnyc.com if this is the case. And if your ring doesn’t have obvious damage or breakage, we’re always here to help if something you can’t quite place is off, even after wearing your ring for months. Here’s an example: About two months after Tim and his wife purchased their rings from Catbird, he noticed that his band wasn’t fitting comfortably on his finger. “I’m not sure if I dinged it or if it was a wear-and-tear situation after two months, but it was starting to dig into my skin,” he shares. So he brought it back to Catbird and says he was amazed by the care he received. “The staff took care of it immediately, and they were so sweet about it,” he says. “They were apologetic even though it wasn’t their fault. The repair came back really really quick -- it took only a few days.” We helped smooth down his ring so it fit him better without any uncomfortable moments. Tim has now been wearing his Catbird for four years without any issues. And if another issue arises with Tim’s ring, we’ll be here to help! We’re proud to have helped thousands and thousands of customers over the years make these very personal decisions. It is our privilege and passion. If you have any questions about a specific ring, or the process in general - please be in touch!